Born in London, Edward Armitage went to Paris in 1835 to study at L’Ecole des Beaux-Arts in the prestigious atelier of Paul Delaroche (1797–1856). It was not long before Armitage became one of Delaroche’s favorite students and assisted the master in painting some of his major works. In 1842, Armitage for the first time exhibited in the Salon with his painting, Prometheus Enchained, and the very next year he felt able to return to his native England, where he competed for the decoration of the Houses of Parliament, a project which won him a substantial prize. He went on to win numerous other prizes and obtained commissions for his grand, historical schemes from both the Royal Family and for public decoration such as those in the House of Lords. 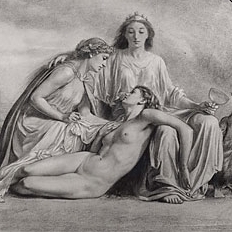 From the 1840’s on, Armitage exhibited in the Royal Academy on a regular basis, gradually leaning towards more religious themes in his paintings. He was made an Associate of the Academy in 1867.